Thank you for notifying JULIE before digging. Your reference number (JULIE Dig Number) includes important information; please review and save this information. As you know, this is a free call and service. Below are a few tips to let you know what happens next. Member utility companies should have their underground lines marked sometime between the receipt of your confirmation and the dig start date and time included in your confirmation information. 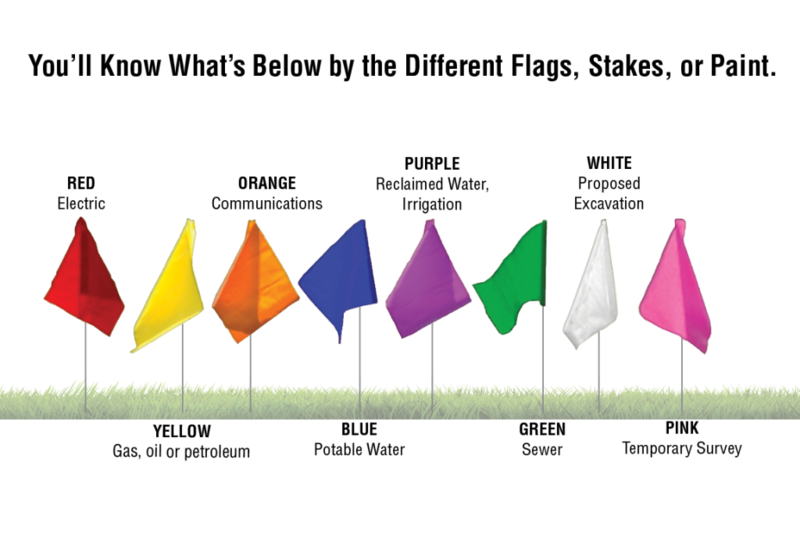 A representative from each member utility company will either mark the location of their facilities with paint and/or flags or let you know that their lines are not in conflict with the area in which you are planning to dig. It is important that your property is accessible or delays may occur. As an important reminder, JULIE personnel are not utility locators and do not visit dig sites nor locate any underground lines. Note: Member utility locators should always have clearly visible identification and rarely need to enter your home to complete a locate request. When Can I Start My Project? You may not begin your excavation before the dig start date and time, even if all the underground utility lines have been located and marked. State law requires your digging project to begin within 14 days of the issuance of your reference number (JULIE Dig Number). Excavation should be carefully performed only after confirming that all member utilities have marked the location of their underground lines or notified you that they have no buried lines in the area. If any of the member utilities listed on your locate request ticket have not responded or, if it is clear that an underground utility line has not been marked, call JULIE at 811 or 800-892-0123. Call center agents are available 24/7/365. Locating an underground utility line is not an exact science. The marks indicate the approximate location of a buried line. If possible, dig outside the tolerance zone, which is 1.5 feet on either side of the mark. If you must excavate within the tolerance zone, dig next to the marks, not on top of them. Hand dig with extreme caution if you must excavate within the tolerance zone. If at any time during the excavation the markings are no longer visible, you are required to call JULIE and request that the markings be refreshed. Member utility companies do not mark non-utility owned or privately installed lines. Examples of private lines can include, but are not limited to, water and sewer lines from the street to the house, electric and telephone lines from the house to a garage or shed, gas grills and pool heaters, underground sprinkler systems and invisible fences for pets.